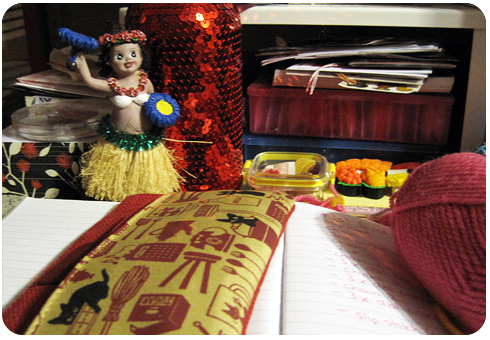 For My Creative Space this week, I thought I would take photos of the crafty things on my desk. My creative spaces are primarily my desk or the lounge. 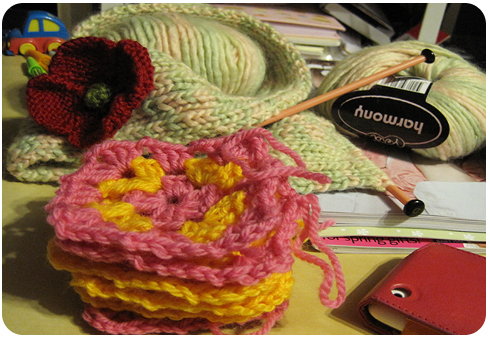 Two main projects on the go at the moment, a ribbed scarf and a rapidly growing pile of granny squares. What is your Creative Space like? Visit others and join in the fun! Alysha, So in love with the pretty harmony yarn you have in your photo. A scarf? Your granny squares look fabulous. You know, last night I started a multi-coloured granny myself. My eldest now wants me to just keep going and do one big square. I am so torn, as initially I was going to make hundreds of granny’s, but he thinks that just the one big square will look better. You know what, I reckon he is going to be right too. I am working with 3 rather bold colours and was going to break it up with plain coloured squares in between. 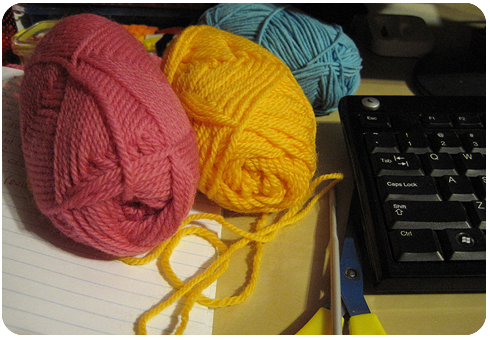 Now tonight, I am thinking I might just do a few grannys for either end, then do granny stripes for the middle bit. Awww so many decisions one has to make. lol. I’m liking the flower on the scarf! Joyce – Okay I am going mad, I could have sworn I replied to your comment. I must have dreamt it lol! I love the idea of one big granny square as a blanket! I love the pattern of the shells on those, so pretty and soft looking. I haven’t quite figured out anything beyond the basic granny sqaure yet, hehe I got he Harmony yarn at Spotlight, it’s really soft to knit with. ohhh, gotta get me some Harmony yarn, even sounds good.